You must log in to select this option. Click the button at the top right hand corner of the screen and enter your email address and password. If you do not know your password, select "forgot password". Any questions, contact info@pafia.org. 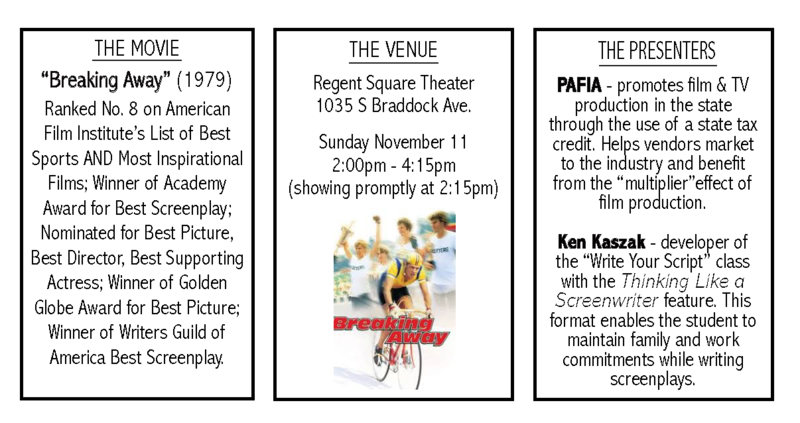 Consider joining PAFIA and supporting the film industry in PA! All PAFIA events are free to members. Go to pafia.org/membership to join prior to registering and this event will be free too! "What was the screenwriter thinking?" Much of the screenwriting process takes place away from a keyboard and desk. The story, the situations, character introductions, subplots, story points, set-ups, "gags", transitions, edits, scene descriptions, etc. are all thought about long before the writer downloads screenwriting software onto their computer. Many times-if not most-the ending is known before the beginning. In this presentation, we are going to screen an Academy Award-winning movie and dissect it to determine (the best we can) what the screenwriter was thinking during the story structure and outline process. Current members: Log in to your profile to register for the event. Want to join PAFIA? Visit www.pafia.org/membership and this event is free! Attendance entitles you to a 20% discount on "Fade In" screenwriting software, a chance to win a Fuji "Absolute 2.0" road bicycle, and a discount on the "Write Your Script" screenwriting class!